James Niels Peterson was born in Philadelphia on August 18, 1908. After attending West Philadelphia Catholic High School and Mercersburg Academy, Peterson enrolled in the University of Pennsylvania in the fall of 1928, graduating from the Wharton School four years later. 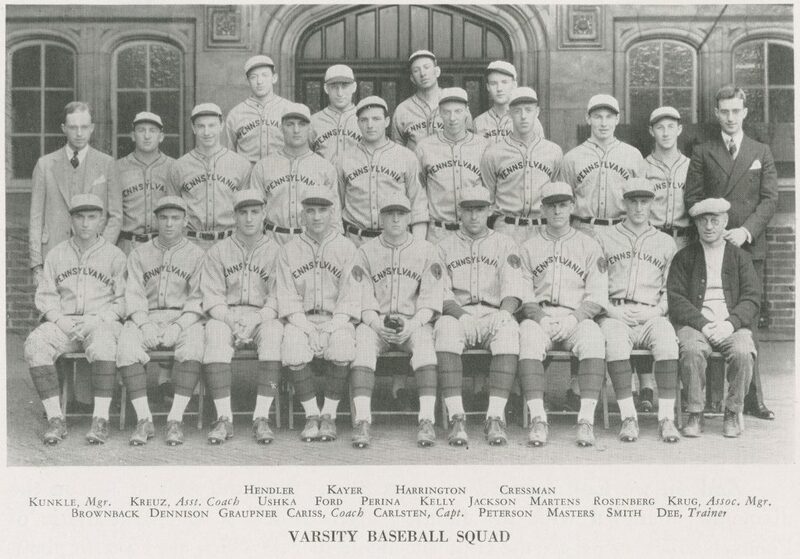 Peterson, a four-letter man at Penn, played four years of varsity baseball (as pitcher) and varsity basketball (as center and guard) plus two years of varsity football (as fullback and quarterback). As a freshman he played on his class’ basketball, baseball, and football teams. By his senior year, he was captain of both the football and baseball teams. He belonged to the Sphinx Society, the Newman Club, and Sigma Alpha Epsilon and Phi Kappa Beta fraternities; he was also his class’s treasurer in his senior year and Cane Man in his senior year. Later in life, Peterson studied law at Temple University. During the summer after his college graduation, Peterson made his major league debut as a pitcher for the Philadelphia Athletics on July 9, 1931. He played for the Athletics when they won the 1931 World Series. The following season Peterson played in the minors for the Portland team, before returning to play again for the Athletics in 1933; he remained associated in other capacities with Connie Mack and the Philadelphia Athletics until 1949. During the 1937 season, Peterson played for the Brooklyn Dodgers and then worked briefly for an advertising agency. During the late 1940s and early 1950s, Peterson managed Old Bookbinders Restaurant in Philadelphia. In 1955 Peterson then moved to Palm Beach, Florida, where he bought the Ta-Boo Restaurant, a large establishment popular with Palm Beach Society. His daily golf partners there were Bernard Gimbel and Gene Tunney, the former boxing champion. Peterson died in Palm Beach on April 8, 1975.